Gov. Paul LePage on Monday called on the Federal Rail Authority to review the approval process for a 60,000-square-foot train layover facility in Brunswick. BRUNSWICK, Maine — Gov. Paul LePage on Monday joined a neighborhood group in calling for a “significant and thorough review” of the approval process for a proposed train layover facility in Brunswick. In a letter to Joseph Szabo, administrator of the Federal Railroad Administration, LePage raised concerns that the plan for a layover facility could interfere with his administration’s efforts to create jobs at the former Brunswick Naval Air Station. He also questioned whether rail officials had done appropriate “due diligence” to gauge potential threats the facility could pose to the health of residents who live nearby. The Northern New England Passenger Rail Authority, which operates the Downeaster service for Amtrak, plans to build a $12 million train layover facility on tracks between Church Road and Stanwood Street in Brunswick. The 60,000-square-foot building would allow trains to idle during the day and power down overnight instead of returning to Portland late at night only to arrive early the next day to pick up more southbound passengers, rail authority executive director Patricia Quinn has said. The building also is designed to reduce noise and pollution by allowing trains to power down during the day. In the past, rail authority officials have said the facility would make it possible to add trips to and from Brunswick, enhancing the value and cost-effectiveness of the passenger rail service that returned to Brunswick in 2012. However, since the site for the facility first was proposed, neighbors have vigorously opposed it. They have cited noise pollution and other negative environmental effects as well as diminished property values and quality of life in fighting the proposal. In September, an environmental assessment of the project determined that the facility would not hurt the neighborhood, The Forecaster reported. But members of the Brunswick West Neighborhood Coalition, an organization created to oppose the facility, assert that the environmental assessment may be flawed. The group — and LePage — say significant changes to the building plan were not incorporated into the environmental assessment, including moving the building and related tracks nearer to residential properties. The Federal Railroad Administration is reviewing the environmental assessment to determine whether a full environmental impact study will be required. 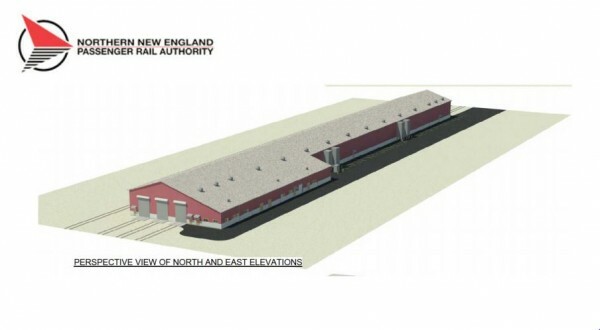 According to the Northern New England Passenger Rail Authority, construction cannot begin until the federal agency determines that the project complies with the National Environmental Policy Act. Funding for the project also must be secured. Repeating another objection raised by neighbors who oppose the project, LePage questioned how the proposal meets federal standards that exempt it from state and local design oversight. The governor also questioned whether ridership of the Downeaster to and from Brunswick warranted the facility, and said an alternate location might better stimulate economic growth. “Two of the other three [potential] locations in East Brunswick have positive economic potential by combining passenger, freight and multi-modal service to stimulate redevelopment of the former Brunswick Naval Air Station, without undue negative consequences for established residential neighborhoods,” LePage wrote. In a March letter to Brunswick resident Robert McEvoy, King declined to intervene. On March 17, LePage nominated McEvoy — who lives near the proposed layover facility — to the Northern New England Passenger Rail Authority board of directors. McEvoy has spoken publicly of his opposition to the project. On Monday, Brunswick Town Council Chairman Benet Pols told the Bangor Daily News that the council would discuss on April 7 the neighborhood group’s request that municipal officials send a similar letter to the Federal Railroad Administration. Pols said the council on Wednesday received a legal opinion on the value of such a letter and was told that while the official comment period has ended, federal officials might still consider comments. Quinn did not respond to phone calls on Monday.